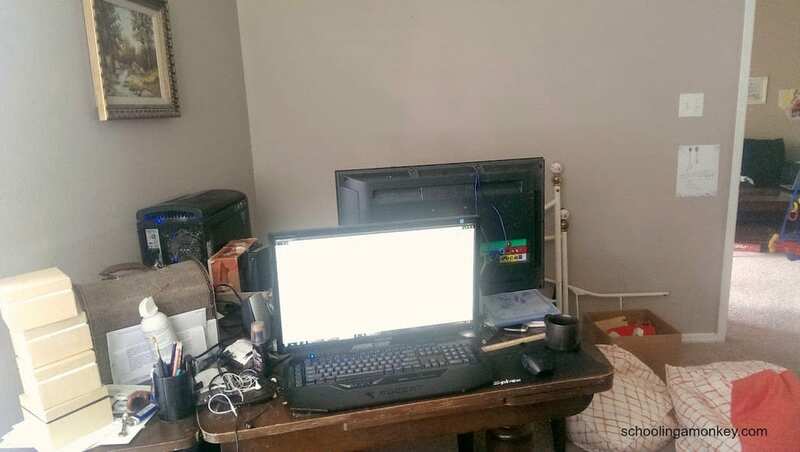 Our house is small, so we don’t have a dedicated school room. Usually, Monkey drifts between sofa, coffee table, and kitchen table to do her various subjects. 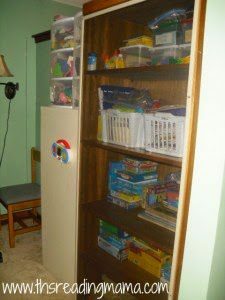 We have some dedicated storage to school books (like our school cubby), and we keep all school/craft supplies in a closet in my home office. This year, we have to get extra creative because a friend of the family is coming to stay with us a while, so his stuff will have to be stored in our normal school storage areas. I started the school room organization project today, and right now, this is what it looks like. Don’t be fooled, it looks much worse in the closet. And this is after I organized it in the spring. I don’t like to spend a lot on projects, and right now, we have an even smaller decorating budget than normal. 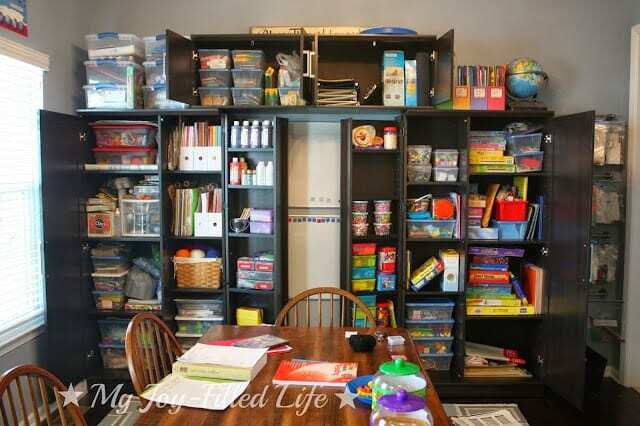 That is why I’m getting creative and using as much stuff from around the house as I can for school room decorating. The first step is to eliminate all but the essentials. We have quite a bit of stuff that doesn’t have to be stored in that room, so I’m going to move it elsewhere. I’m also going to ditch anything that I know we won’t be using. It doesn’t really help to simply go out and buy a bunch of organizing items that you won’t know how to use. Think about what you need to store and how you want to store it before visiting any organization shops. It’s easy to get overwhelmed with storage options, but if you know what you need to store, then it becomes much easier to find the right storage items. I know we’ll likely have to purchase a few storage items, but I want to use as much as I can from what we already have. Containers are easy to craft from small cardboard boxes, plastic containers, and baskets. Shelves are a little harder, but if you have a shelf that isn’t getting much use in another room, move it to where it can be used best! With a little ingenuity, you can significantly reduce how much you need to purchase. After you have your storage items, put everything away where you want it to go. One thing I’ve found that deep shelves are usually a bad idea when it comes to school supplies. It is easy to push stuff back and forget about it. Narrow shelves are ideal for showcasing what you have at a glance. Don’t stack things on top of each other or put things in front of other supplies. This quickly leads to disorganization. Everything should be easy to get and, more importantly, easy to put back in its proper place. You don’t want to have to take out paper, pencils, sewing supplies, and play dough to get to your school books. That’s just a recipe for disaster! Trust me, I’ve done it. Our theme will be travel, because I love how old maps and luggage looks. You can find inspiration everywhere. One of my favorite places to look, however, is Etsy. One of the reasons I like Etsy is because most of those projects are handmade, which means they will be easier to reproduce than something you find at Crate and Barrel, for instance. Etsy shops often have creative projects that you might never have thought of, but that are quite easy to reproduce. Of course, if you see something you absolutely love, you should buy it! That is another one of my rules for decorating. Try to make what you can to keep things low-budget, but splurge on a few of your favorite items. How do you know what to splurge on? I follow the rule of the 20-minute sweater. In Gilmore Girls, the girls could not buy a piece of clothing unless they were still thinking about it 20 minutes later. I extend this rule to a 2-week period (longer for really big items). If it makes you just as happy and in-love 2 weeks later and it fits in your budget, then you can buy it. Here are some ideas that have sparked my creativity. I love the feeling of Restoration Hardware, and if we had an endless budget, all of the rooms in our house would be furnished from there. 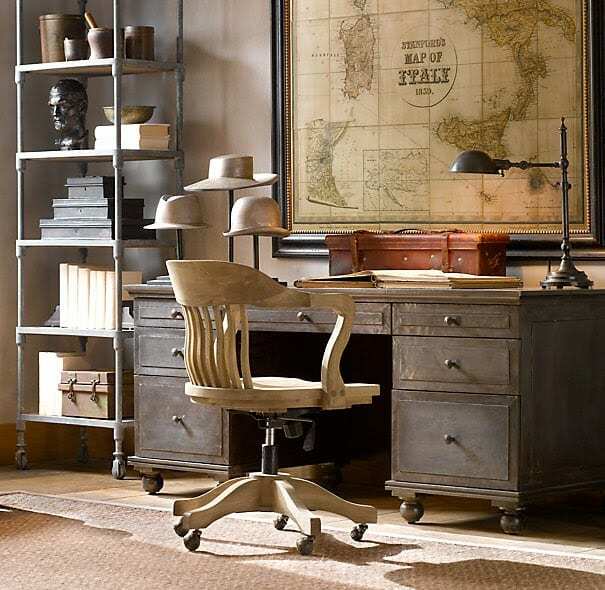 I really want to create a travel theme in our office/school room, because I think it looks awesome! This is the kind of feeling I hope to re-create (which won’t happen, but maybe I can create a semblance of it). Organization is essential in a shared space, and organizing is not my strongest suit. 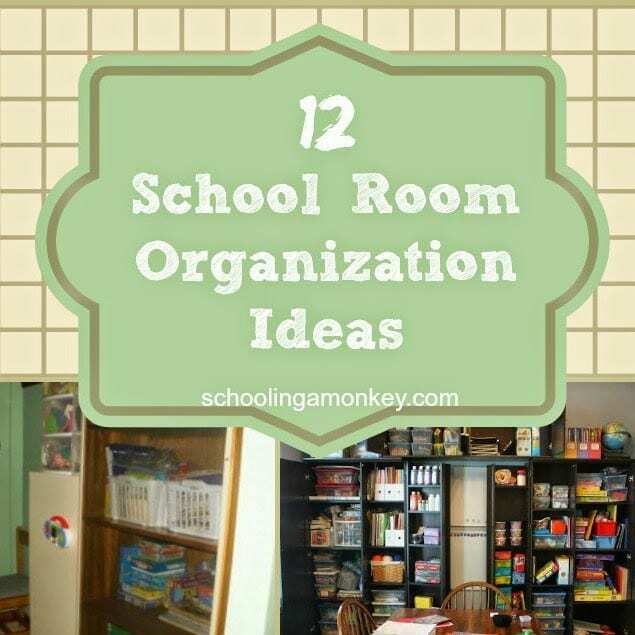 That is why I’m looking to organization experts for some school room ideas on how to organize. 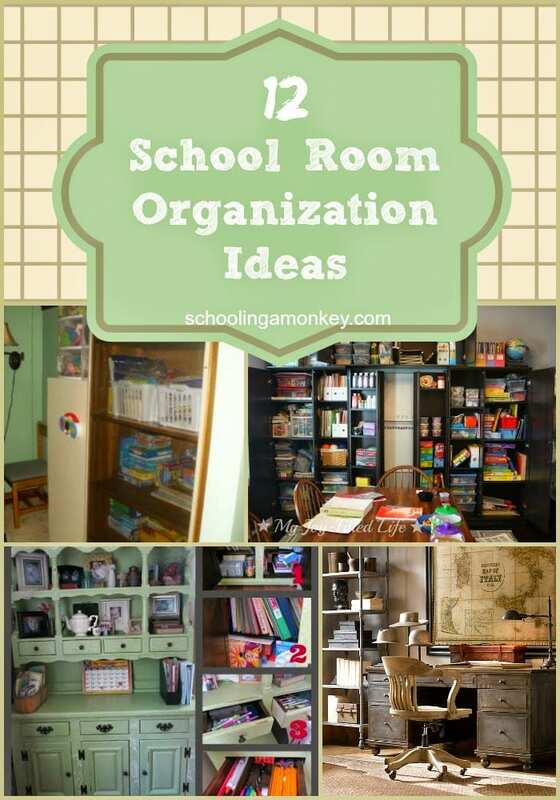 Check out how organized and refreshing School Time Snippets school room looks! My Joy Filled Life is killing it with those shelves! Check out these colorful shelves in the The Chaos and The Clutter school room! I love how school rooms can change over time. 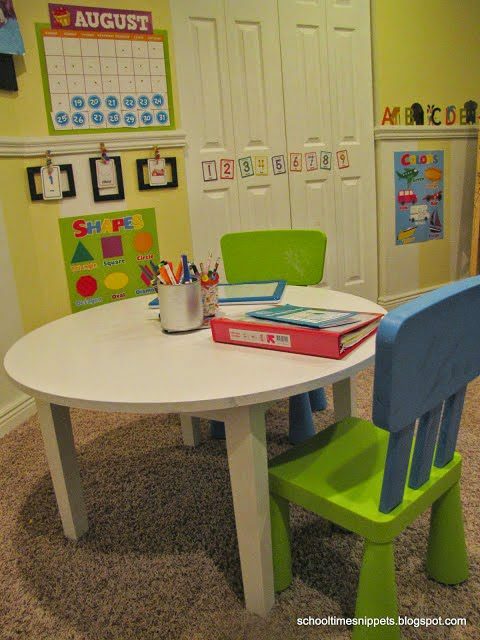 At first, the school room from This Reading Mama was perfect for tiny learners, but as her kids aged, she updated the room to fit current needs. I love how she uses a screen door to keep the kids from spilling the containers! 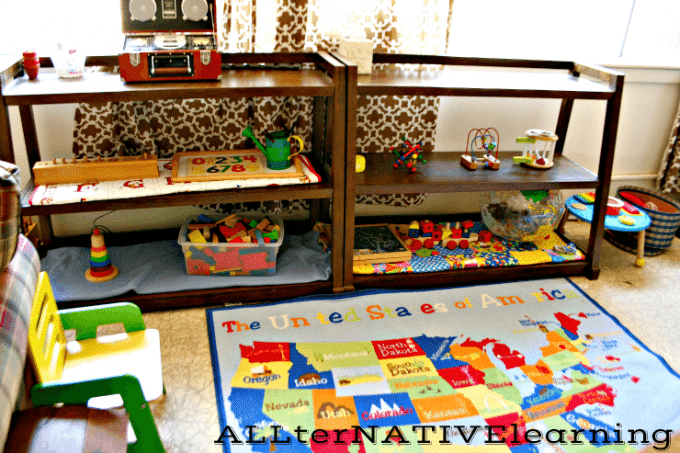 Although Monkey and Bo share the same school space, if you have younger kids only, I absolutely love this preschool-themed school room from Alternative Learning. Just because your kids go to school at home doesn’t mean they can’t have lockers! 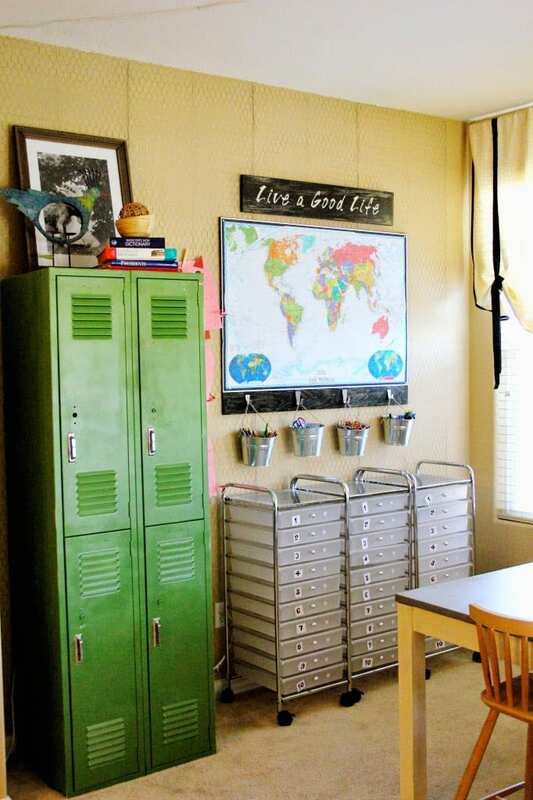 I don’t know where she found them, but Just a Night Owl uses real, legitimate lockers in her homeschool classroom. Just let that sink in. Real lockers. Can you handle the awesome? Photo via Just a Night Owl. The Unlikely Homeschool may have my favorite storage solution yet! 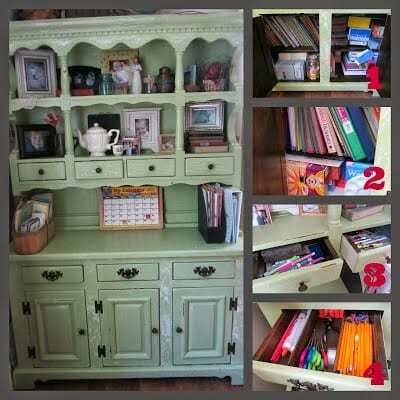 She hides most of her kid’s school supplies in a china hutch! How amazing is that? 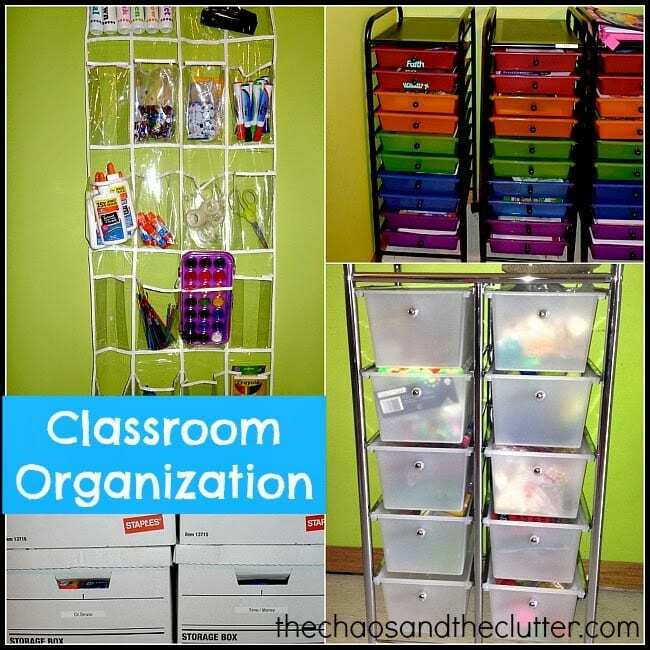 So, what do you think of these organization ideas? Do you think I can transform our room?